I am trying to set up a load cell using the HX711 amplifier. Whenever I upload my sketch, my serial monitor only will read zeros regardless of load applied to the sensor (no signal appears to be sending from my load cell). Here is my wiring, with the Arduino Uno connected to a COM port. I am using an Arduino Uno, HX711, and Sparkfun's TAL220 Straight Bar 10kg load cell. 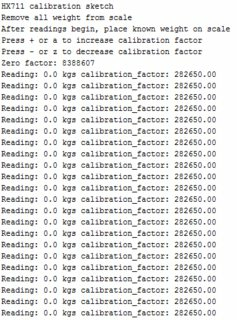 And here is a typical output from the serial monitor (I previously had this load cell functioning correctly, which is why my calibration factor is so different). Whenever I upload the sketch and open the serial monitor, the TX LED on my Arduino Uno will light up flashing, but the RX LED stays off. I have tried adding an external power supply to the hookup assembly (I don't know if this is even necessary, but I know the load cell requires excitation to function, so I thought I'd give it a try). So far it has not changed the output in any way. 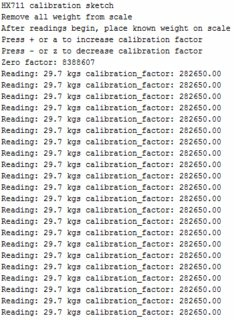 I have also tried adjusting the calibration factor, which only offsets the constant value outputted. I have re-soldered the connecting wires to the load cell and replaced the remaining wires, as well as tried multiple Uno Boards and a new USB cord. I have also gone over my wiring and had my labmate check it too (though I will definitely not rule out it being some small wiring/hardware mistake on my part, as I am still very new to Arduino). The zero factor 8388607 showed up in a similar question on another forum and is associated with the range of the HX711 amplifier. This indicated that my amplifier was broken; I have since replaced it and am now receiving a signal from the load cell. Not the answer you're looking for? 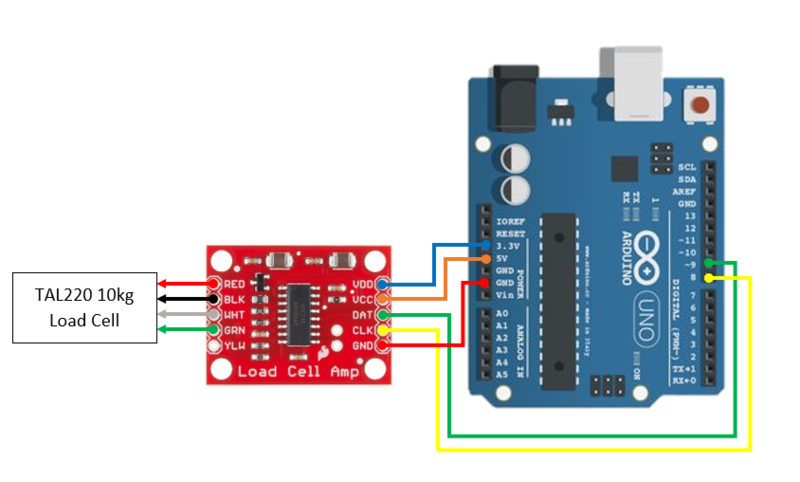 Browse other questions tagged arduino-uno serial sensors pins serial-data or ask your own question. How to get weight data from glass electronic bathroom scale sensors? Graphing force sensor data routed through HX711? I have a diagram of my Arduino circuit. How do get it ready for PCB manufacture?